Brad Beller Construction can help you build the outdoor space you always wanted at your home in the area of McHenry and Northwest Kane counties in Illinois, starting with custom cedar deck installation. Cedar decking offers many advantages when compared to other types of wood, making it a versatile and appealing choice for your new deck. Brad Beller Construction can design and build a brand-new cedar wood deck for your home, including custom cedar deck railings and features that provide you with a beautiful and enjoyable outdoor space. Whether you’re replacing an old deck, building a deck as part of new home construction or adding a new deck to your existing home, installing red cedar decking can add beauty, comfort and resiliency to your outdoor space. Cedar wood is naturally resistant to bugs and decay and boasts a rich color and detail. Cedar is also very weather resistant, meaning that it will outlast the elements and allow you to enjoy your custom cedar deck for years to come. Brad Beller’s experienced cedar deck builders will work with you to create a custom design that fits in with your home’s aesthetics while offering you a space that’s tailor made to meet your needs. 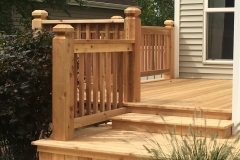 When you’re ready for your complete deck construction, their team of experienced cedar deck installers will build your new deck fast, adding comfort and versatility to your home in Algonquin, Lake in the Hills, Lakewood, Crystal Lake or elsewhere in the Northwest Chicago suburbs. 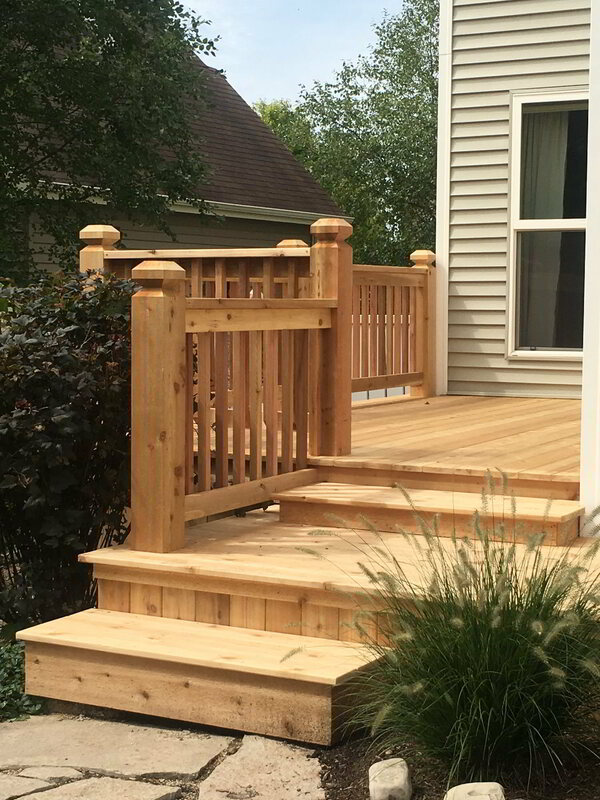 Brad Beller Construction works with homeowners throughout McHenry and Northwest Kane counties, and can work with you to design and install the cedar wood deck of your dreams. To learn more about adding a new red cedar deck to your home, or to speak to the professional cedar deck builders at Brad Beller Construction about what you have in mind, give them a call today at 815-455-8051 and get started on making your vision a reality! © 2019 Brad F Beller Construction .